We had one oral and three poster presentations at this year’s AGU Fall Meeting in San Francisco, CA. Regina Penz was doing an FFG-funded internship in our lab during September. Regina continued Dorian’s and Theresa’s work from July and August and further assisted us in keeping our measurement sites in shape. The picture shows her at our site in Neustift, Stubai Valley. This month we welcome Dorian Hammerl to our group who is doing an FFG-funded internship in our lab during August. Dorian is continuing Teresa’s work from the month before, mainly working on the tree drought experiment (StartClim project) that started at the beginning of July. 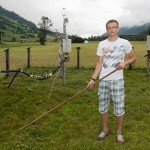 The picture here shows him at our study site in Neustift. Georg spent a week in Aosta Valley, Italy, studying CO2 advection at the subalpine grassland site Torgnon together with Marta Galvagno and colleagues from ARPA Valle d’Aosta. The pictures show the study site in the fading light of day and the prominent peak of Matterhorn (Cervino) across the border to Switzerland. The video shows an attempt to visualise nighttime downslope flows using a fog machine (usually used for parties ….). We welcome Teresa Weber to our group who is doing an FFG-funded internship in our lab during July. Teresa is mainly working on the tree drought experiment (StartClim project), that started at the beginning of this month. 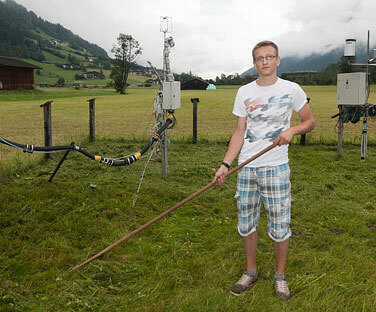 This picture here shows her checking instrumentation at our study site in Neustift.